It’s a VGChat! I’m here with Kotaku’s editor-at-large Kirk Hamilton to talk about Undertale, which came out for PC back in 2015, but is available today for PlayStation 4 and Vita. Hence our renewed interest. Spoilers ahead! Do not get spoiled! Chris Kohler: Kirk, you played through the game on PC, yes? Kirk Hamilton: I did! On my crappy Mac laptop, to be more specific. It wasn’t exactly difficult to play this game if you had any kind of a computer you could use, but it’s still nice to see it playable on a game console. Chris: Right. Undertale, inspired by and often referring back to console JRPGs like Mother/EarthBound, feels at home on a console versus a PC. I’m kind of embarrassed to admit that I only got an hour or so into the PC version before I “took a break” and then, oops, never came back and actually played through the rest of it. So when Sony announced it (with no small amount of fanfare) for PS4 and Vita at E3 this year, I knew this was my chance to finally knock it off the Pile of Shame. And I’m glad I did! What a game! Chris: Yeah. The way it plays with the conventions of the genre, all of that really coalesces in those final encounters. It’s up there with, say, Stanley Parable or Papers, Please, these masterpieces with very crystal-clear artistic views of what they’re intending to accomplish. Although in this case I think you need some level of familiarity with this style of role-playing game to really feel the impact of it all? Kirk: Doubtless true, though I actually haven’t really played EarthBound and I got the gist. Undertale sits atop a couple decades’ worth of accumulated fan culture surrounding this style of RPG, but I’d say it’s got a distinct enough perspective that I felt like I understood it despite missing half the inside jokes and references. I understand you got the pacifist ending too, yeah? Chris: I did. I mean, this game very clearly communicates to you that you can get through the whole thing without ever killing anyone, so of course I just looked for the so-called pacifist route that would let me either run from or let off the hook any monsters that came my way. And it wasn’t that difficult, really, with some exceptions. Since you only have a few menu options available to you, you can just cycle through them and see what the golden path is to sparing any enemy. The only exceptions were Moffet, the spider-lady, where the way you get through is literally just sit and listen to, I think 18 different dialogue sections while dodging her worsening attacks? (You can use an item from the Spider Bake Sale but I didn’t have one.) Then, I had to look it up in a FAQ just to make sure that simply plowing through was the solution and there wasn’t something more elegant. And with Asgore, I thought the game was tricking me. It was like, oh, you HAVE to fight him! But my initial reaction was “no, game, you’re just trying to trick me!” But you did. Kirk: Did you go and watch the other endings on YouTube? Chris: No, but I did read about what happens if you kill anyone, and especially what happens if you kill everyone. Kirk: Did you kill the training dummy in the beginning? I believe the game gives you that one as a freebie, though he comes back pissed off later and you have to let him live. When I started a new game on PS4, I knew better. Chris: I did not, no. Kirk: I’m proud of you. And the dummy thanks you. Chris: So did you perceive any differences between the PS4 version and the PC one? Kirk: I haven’t noticed any differences, no. You can put a little backdrop on outside of the gameplay area, since the game isn’t in 16:9 format, but I actually just leave it black. Sony also sent along their new dynamic Undertale theme, but I gotta say it just gives me a headache. I do like that the game is playable on Vita now, though. It’s always felt like it should be on a handheld system. Now that you’ve finished, I want to know more about what you think of the characters. For example: are you team Sans or team Papyrus? Chris: Ha! Of all of them I think Papyrus gave me the most laugh lines, so probably Papyrus. Kirk: I still think back to the date with Papyrus from time to time. Maybe my favorite bit in the game. Chris: Yes. Or when he jumps out the window in Undyne’s house? Kirk: Hahahaha, yes. Though I do love the sound it makes when Sans talks. Like, when text moves across his text bubbles. Uh-uh-uh-uh-uh. Uh-uh-uh. Chris: Everything in this game is so, so carefully considered. It’s a short game in a small world, but every aspect of it was hand-detailed in that way. And the fact that you can walk back through it at any point and talk to people and find that things are changing—that’s what one really wants out of an RPG like this. Kirk: Yeah. Everything in it is so clearly handcrafted, including the music. As I replayed over the weekend, I was struck by how good every single piece of music on the soundtrack is. In the music perhaps more than any other single aspect, Undertale clearly comes across as the work of a single creative voice. So I’m curious of your take on something. You’re more steeped in the whole ROM hacking/emulation/fan translation world than I am. Undertale is a product of that world. I haven’t really noticed many other games like Undertale in the two years since it came out. Nor have I gotten the sense that this sort of retro RPG might have a resurgence, despite the success of the arguably similar Stardew Valley. Am I off on that? Or am I making a hasty judgment? Could Undertale still lead to more reimagined, modern versions of those sorts of games? Chris: You know, Kirk, as I discuss in my upcoming book Final Fantasy V, I do think that what I will for lack of a better term call “the 16-bit JRPG” should not be considered as a sort of step in the progress of game design, or as an intermediate waypoint through which RPGs passed to become better and take up more space on a DVD and have more realistic graphics, but a valid expression of the form that really has its own strengths in terms of gameplay and storytelling. Chris: The abstraction of the top-down, sprite-based, 2D gameplay can often make for a much more streamlined game experience. Walking across a world map in a single minute, versus however long it would take you to go from one end of the map to the other in Witcher 3. Kirk: Yeah, which serves to put the focus squarely on the individual characters, and your interactions with them. Each thing in the game feels specific and important in a way that’s harder to communicate in a higher fidelity game. Chris: That sort of thing. So I love it when I see today’s designers trying to work within those constraints, because I see it as much more than a throwback, I see it as an understanding that it’s almost its own genre. And everything must be hand-detailed, rather than procedurally generated. Yes. So when you look at Cosmic Star Heroine and the other games from that developer, for example. And now Undertale. Square Enix attempted to do this with I Am Setsuna, but didn’t have the chutzpah to just go all the way and make a 16-bit RPG on a console. Kirk: Yeah, so they got a game that played in a lot of ways like Chrono Trigger, but looked like a much more generic game. Chris: Right. It should have looked like Chrono Trigger! Undertale’s massive popularity will hopefully bring more of that to the table, although these games must be done, as this one was, from a place of genuine admiration for the form, and with an understanding of why it worked, and play to its unique strengths. 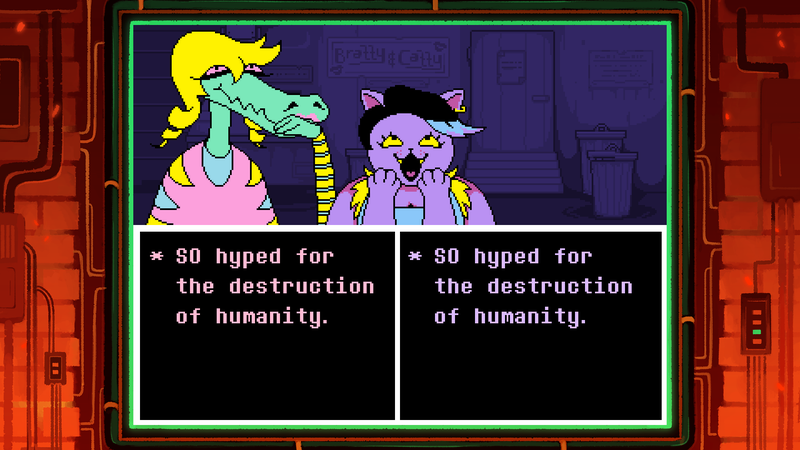 So I’m hopeful that Undertale’s console release will bring it to more players. I’m a little surprised that it’s not on Switch. But not that surprised. Kirk: Even just a couple years after it came out, I sometimes forget how revolutionary some of Undertale’s ideas were. Like, just the fact that it was an RPG where you won fights by listening to the monsters and understanding their problems! As Nathan said in his 2015 review, it’s a game about loneliness, and community, and reflection. Sadness, regret, insecurity and depression, all these feelings, almost none of which get play in modern video games. If Undertale goes on to influence a new generation of modern game, I hope its influence goes beyond the specific attributes of the 16-bit RPG and spreads into characters, theme, and subject matter. And yeah, I would love to play it on Switch! Though for now, I’m just happy that more people will be able to play it on more platforms. Kirk: Yes! I remember talking with people about that back when Undertale came out. Makes you wonder which of today’s derided ideas will eventually form the backbone of tomorrow’s revolutionary games. Chris: Anyway, Undertale! It is great! Play it. I don’t know what else to say. It’s on consoles! Kirk: Yeah, that about says it all.